Clifton and Lobe just wrote the piece “Trump’s Choice of Bolton Satisfies His Biggest Donor,” which states: “Last August, shortly after John Kelly replaced Reince Priebus as White House chief of staff and Steve Bannon was fired as the president’s chief strategist, John Bolton complained that he could no longer get a meeting with Donald Trump.”Just three months later, however, on the eve of Trump’s belligerent address to the United Nations, Bolton was once again in direct contact with the president. How did this turnabout take place? 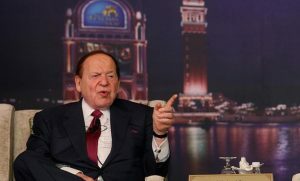 The reconnection was reportedly arranged by none other than Sheldon Adelson, the Trump campaign’s biggest donor. Lobe served for some 30 years as the Washington, D.C. bureau chief for Inter Press Service and is best known for his coverage of U.S. foreign policy and the influence of the neoconservative movement. Clifton reports on money in politics and U.S. foreign policy. He previously reported for the American Independent News Network, ThinkProgress, and Inter Press Service.